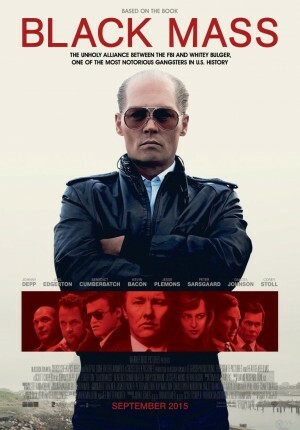 “Irish Cold blooded Gangster in South Boston"
This movie tells the true story of Whitey Bulger, the brother of a state senator and the most infamous violent criminal in the history of South Boston, who became an FBI informant to take down a Mafia family invading his turf. This heart of the film is on Johnny Depp who acted cold like the cobra snake that makes anybody got goose bumps just to stares at him. Very different form his other role as the weird pirate, Jack Sparrow in Pirates of the Caribbean. Acted as his brother, the senator who always cleans his name is Benedict Cumberbatch, and for his partner the tricky FBI agent Joel Edgerton. And the veteran actor, Kevin Bacon got the role as FBI agent, Charles McGuire who is unable to stem his partner action. And Peter Sarsgaard acted as Halloran, FBI agent who cannot be bribed. As a normal human being, there are scenes from the movie to show how Whitey and Billy really love their mother who lives alone. Whitey also thought his son how to hit his naughty playmate, “But, don’t let anybody sees it!” he said. But after the death of his mother and his son he become more sadistic. From the movie that take the background of Mafia gangster (usually Italy) in U.S., we have known movies like The Godfather, Once Upon a Time in America, Casino, dan Goodfellas. And know this lists will be completed with the story of Irish-born gangster. The unique thing from this movie is that this movie shot in its actual location in South Boston.